California Assembly Bill 880 would impose a penalty on large private employers who have non-disabled employees who enroll in Medi-Cal. In this fact sheet, we analyze the number of working Californians expected to enroll in Medi-Cal after the Afford-able Care Act is implemented. Approximately 250,000 Californians working for firms with 500 or more employees are currently enrolled in Medi-Cal, close to half (44%) in the retail and restaurant industries. 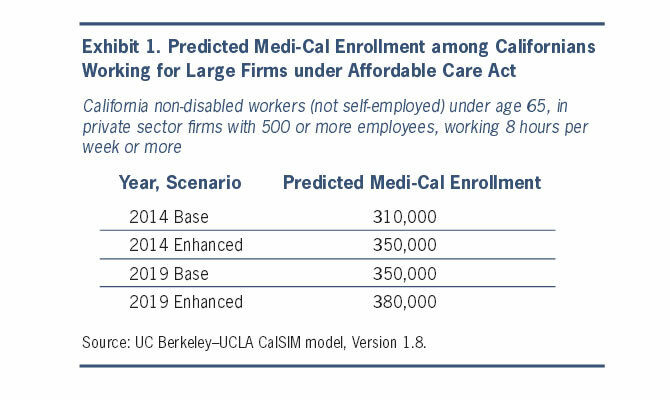 In 2014, between 60,000 and 100,000 additional individuals working for large employers are expected to become newly eligible for and enroll in Medi-Cal under the Affordable Care Act (ACA), for a total of between 310,000 and 350,000 enrollees. By 2019, an estimated 350,000 to 380,000 employees of large firms will be enrolled in the program. Under the ACA, low- and middle-income California families who are not eligible for Medi-Cal or Medicare or affordable job-based coverage can enroll in federally-subsidized insurance coverage in 2014 through the state’s health benefit exchange, Covered California. Employers with at least 50 full-time equivalent employees are subject to a “free rider penalty” under the ACA if at least one full-time employee enrolls in subsidized coverage through a state or federal exchange. If an employer fails to offer coverage to nearly all of its full-time employees, the employer will owe an annual penalty of $2,000 multiplied by the total number of full-time employees minus 30. If an employer offers coverage to nearly all full-time employees but that coverage is unaffordable for some employees or a small share of full-time employees are not offered coverage, the employer will owe an annual penalty of $3,000 multiplied by the number of full-time employees who enroll in subsidized coverage through the exchange, capped at the penalty amount the employer would have owed if they did not offer coverage at all. The penalties were designed to help offset the federal expenditures on subsidized coverage. The penalties are not triggered by employees enrolling in Medicaid. Assembly Bill 880, recently introduced in the California Assembly, would impose a penalty on private employers with 500 or more workers who have employees that enroll in Medi-Cal. Public employers would be exempt. The penalty would apply to on-disabled workers under age 65 working at least 8 hours per week who are currently eligible for Medi-Cal as well as those who will become newly eligible in 2014 under the eligibility expansion. The penalty would be used to pay for the non-federal state share of Medi-Cal for the workers on Medi-Cal and to increase the reimbursement rates paid to Medi-Cal providers. Under the ACA, the number of working Californians enrolled in Medi-Cal is predicted to increase to between 310,000 and 350,000 in 2014 due to the eligibility expansion. In 2019, between 350,000 and 380,000 Californians working for large firms are expected to enroll (Exhibit 1). These estimates reflect the number of workers for whom employers would be subject to penalties under Assembly Bill 880. This fact sheet uses the California Simulation of Insurance Markets (CalSIM) model, version 1.8. The model is designed to estimate the impacts of various elements of the ACA on employer decisions to offer insurance coverage and individual decisions to obtain coverage in California. The model analyzes two scenarios: a base scenario in which take-up follows current enrollment patterns and an enhanced scenario in which California simplifies eligibility determination, conducts strong outreach and education, and adopts other measures to maximize enrollment. CalSIM uses data from the Medical Expenditure Panel Survey Household Component, the California Health Interview Survey, firm-level wage distributions from the California Employment Development Department, and the California Employer Health Benefits Survey to build a California-specific model. For further information, please visit http://www.healthpolicy.ucla.edu/pubs/files/calsim_methods.pdf. Sample weights within the model were adjusted so that pre-ACA totals for the number of income-eligible workers enrolled in Medi-Cal matched those of the 2009 California Health Interview Survey. The calibration was slight and the modified model, when compared with previously published results, did not lead to any significant changes. of California, Berkeley, Center for Labor Research and Education. The California Simulation of Insurance Markets (CalSIM) model was developed with the generous support of The California Endowment. We would like to thank Xiao Chen, Miranda Dietz, Daphna Gans, Gerald Kominski, Jack Needleman, Nadereh Pourat, Dylan Roby and Greg Watson for their involvement in developing CalSIM. The ACA defined “full time” as working 30 hours per week. Under draft IRS regulations, the standard of 30 hours per week was implemented as 130 hours of service per month for purposes of calculating the employer penalties. Current Population Survey, March Supplement, 2010-2012; Californians under age 65 who work for a private sector firm with 500 or more employees. Will Proposed Obamacare Fines Help or Hurt California Workers?